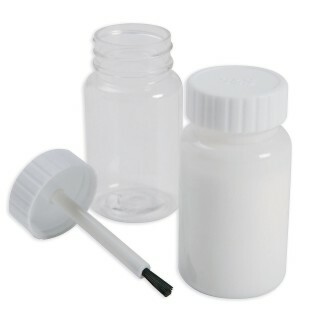 Refillable glue jars with brush attached to lid for easy application. Resealable screw top keeps contents from drying out. Crystal clear plastic so you can see what and how much is in container. Also great for holding paints and decoupage mediums. Perfect for portioning out liquids from larger size so everyone in the group can have their own convenient bottle. Approx. 3”H x 1-1/2” diameter. Holds 2.7 oz. liquid/80ml. Pack of 12. We purchased these to provide an alternate way of applying glue. The small bottles and brushes are great. We will also use them for paint and who knows what other ideas we may come up with!